Here is a healthy cake that you can give your kids in their snack box or in the evening with their glass of milk. The best part about this cake is that it uses ingredients like whole wheat flour (atta) and jaggery that are more nutritious that refined products that are usually used. Another thing I liked about this cake is that it was really easy to whisk. I used just about one mixing bowl and a spoon. Utensils required were minimum and my kitchen was left absolutely clean. The last time I felt that way was long ago, when I baked an eggless vanilla cake. I learnt this wholesome cake recipe from Cecilia, my friend and neighbor. She usually tries her hand at a variety of treats for her two kids. Being a nutritionist she also ensures a balanced diet for them. When I found out that this recipe was doing the rounds of the neighborhood I decided to try it out for myself. One thing is for sure, this is a guilt-free cake. When you know its healthy you don’t end up counting how many pieces each kid ate. 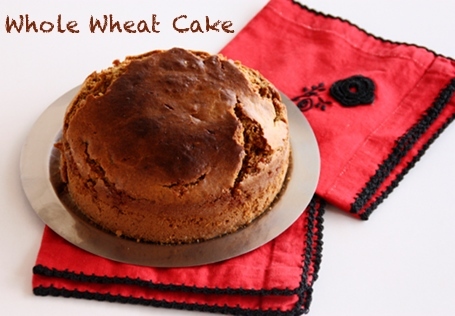 For now, here is the recipe of a healthy wheat cake – bake, share and enjoy. I am sending this cake to the Bake Fest #15 hosted by Sumee’s Culinary Bites. Do check out the entire schedule for the Bake Fest events at Vardhini’s blog. Sift flour with baking soda and baking powder. Add oil, essence and milk. Stir well. Add jaggery and mix well so that no lumps remain. Grease and dust a cake pan. Pour in the batter. Bake in a preheated oven at 180 Deg C for about 25-30 mins. I added about 1 tablespoon of heavy milk cream or malai to the batter. That helps in making the cake softer. Add more milk, if required. Basically the batter should reach dropping consistency. Use organic jaggery powder for best results. Hi , the recipe looks so easy n sounds delicious….can i know the size of cake pan you used? Thanks Sanjana. The cake tin used here has a diameter of about 15 cm. Instead of oil, can I use all malai? How much malai would I need to use? I am not very sure. I think you might need oil, butter or some kind of fat. If I wish to use sugar then shud it be in the same quantity like jaggery. Yes, same or little less. As per your taste.